Jil Jung Juk does have its share of laughs but it lacks the chaos, excitement and crazy fun that would have made the film more enjoyable, writes S Saraswathi. The hugely successful Soodhu Kavvum set the trend for wacky comedies that make little sense but are a whole lot of fun. Newcomer Deeraj Vaidy’s Jil Jung Juk, starring Siddharth, is a similar attempt, though less engaging. 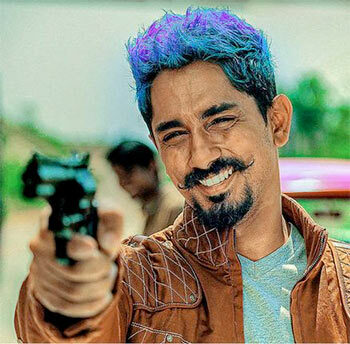 Produced by Siddharth himself, the film revolves around the adventures of three characters on a crazy journey in a pink vintage car, hired to transport cocaine. The film is set in 2020, supposedly a period when the world will be hit by a severe fuel crisis. Dieva (Amarendran), a powerful drug lord, is slowly losing out his business to his old-time rival Rolex Rawther (Radha Ravi) and the police, who are hot on his heels. Most of his supply is intercepted by the police and he needs a new face to transport cocaine to a Chinese dealer in Hyderabad. The mission is handed over to Jil (Siddharth), Jung (Avinash Raghudevan) and Juck (Sananth Reddy). Whether or not they reach Hyderabad with the goods intact forms the rest of the story. The crazy journey has them battling against the oddest characters and the weirdest situations. Cinematographer Shreyas Krishna deserves full credit for creating this strange world, where even the most bizarre incidents seem perfectly reasonable. The blend of certain colours, the lighting and the ingenious camera angles lend an air of unreality to the narrative that is a big plus for the film. Also deserving a special mention is music composer Vishal Chandrashekhar, whose background score is undoubtedly the highlight of the film. The characters created by director Deeraj are just as interesting. A lot of thought seems to have gone into creating the idiocrasies of every individual in the film. In the last few years, we have seen Siddharth experimenting with different characters in different genres. The usually suave actor -- with his crazy blue hair, Chennai slang, a bold swagger and weird expressions -- gives a remarkable performance. Veteran actors Radha Ravi, Amarendran, Sanath, Avinash and VJ Balaji, who appears briefly, are equally convincing. But the film is let down by the ordinary screenplay, which lacks imagination. The dialogues are also insipid and boring. Situations stretch on endlessly affecting the pace of the narrative. The film does have its share of laughs, but it lacks the chaos, excitement and crazy fun that would have made the film more enjoyable. The wacky entertainment that was promised in the intriguing trailer is missing. Despite its faults, director Deeraj Vaidy’s Jil Jung Juk does make a decent entertainer.